Heat a skillet over medium-high heat. Add the bacon then reduce heat to medium and cook until just crisp, about 4-5 minutes. Transfer bacon with a slotted spoon to a paper towel-lined plate. Transfer bacon grease to a small bowl. Wipe out skillet with a paper towel. Heat butter and 1 tablespoon bacon grease in the skillet. Add the scallions and cook until softened, about 2-3 minutes. Add the corn kernels, cream cheese and half-and-half or cream. Continue cooking over medium heat or until cream cheese is smooth. Season to taste with cayenne, salt and black pepper. Transfer half of the corn mixture to a food processor or blender. Process until almost smooth. Return to skillet, stir and keep warm. In a nonstick skillet, heat 1 teaspoon bacon grease over medium-high heat. Season scallops with salt, black pepper and smoked paprika. Cook 2-3 minutes per side or until medium doneness. Stir chopped chives and half of cooked bacon into corn purée. 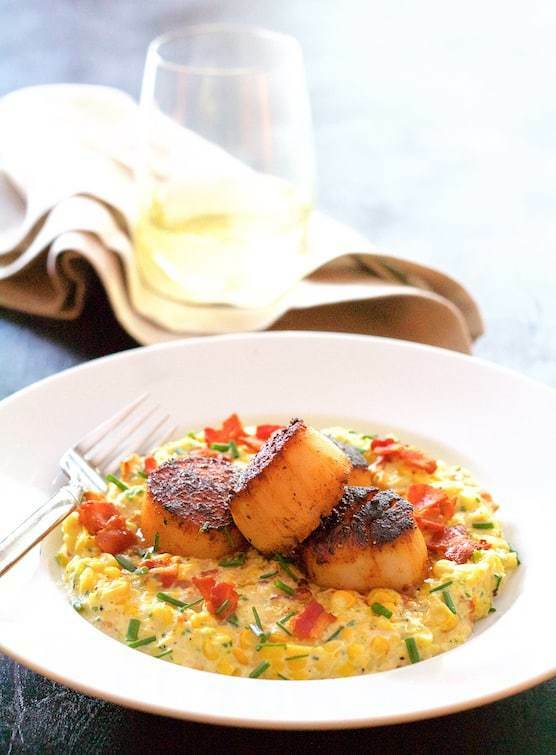 To serve, place scallops over corn purée and garnish with remaining bacon and more snipped chives.